I use things like bacon and cheese to soothe my soul. Maybe that’s not so much “little known” as “widely recognized”, but still. There are some days when I’m feeling less than 100%. We all have those days. And those are the moments when I find myself in the meat and dairy aisle, carefully examining and selecting a pound of the good stuff. And then, because I like to share the love, I cook things with it and serve it to my friends. 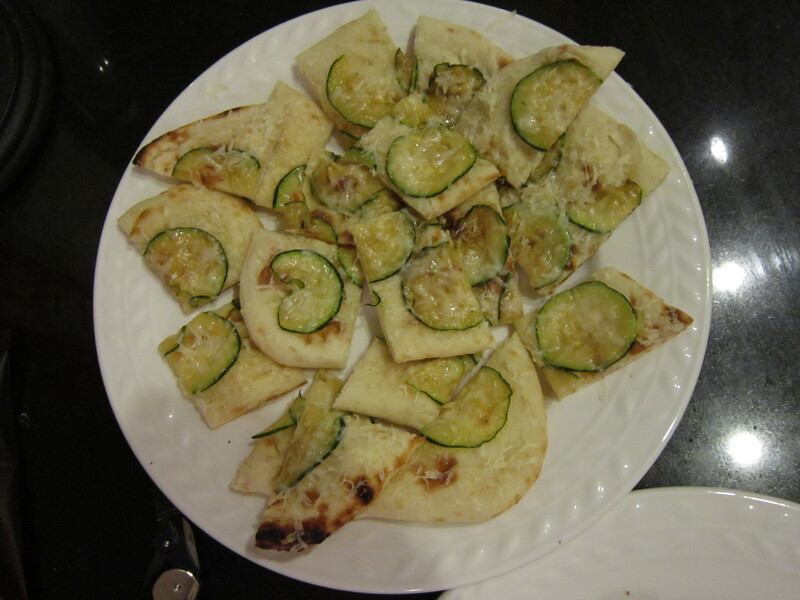 I started with today’s standard: the zucchini parmesan flatbread. This time I left off the potatoes and cut the flatbreads into small, hors d’oeuvre sized bites. I am very much obsessed with this recipe at the moment. I don’t plan on that ending anytime soon. Zucchini-season-ending be damned! 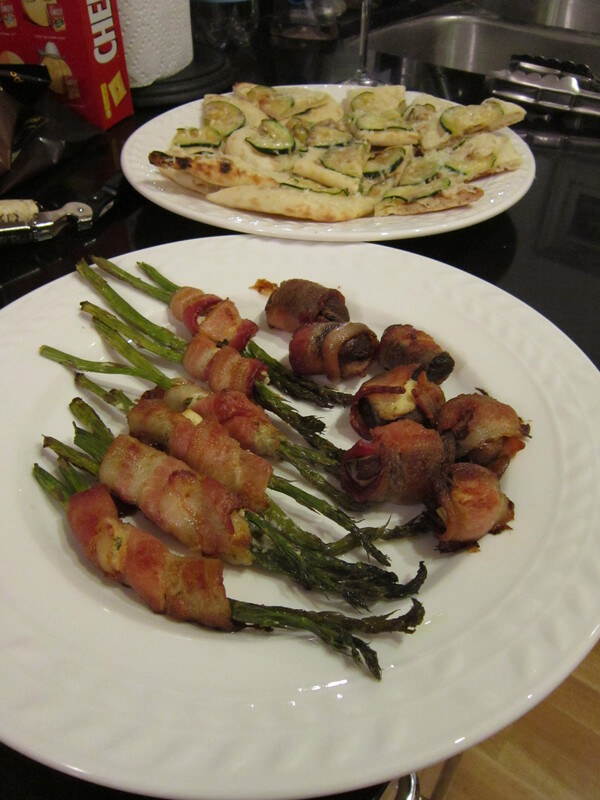 I wrapped bacon around Boursin-topped asparagus and mushrooms, baked them at 400° for about 25-30 minutes and served. Very easy. Very hands-off. Allows you to mingle with your guests. And look, I’m going to level with you. People like you better when you give them bacon. 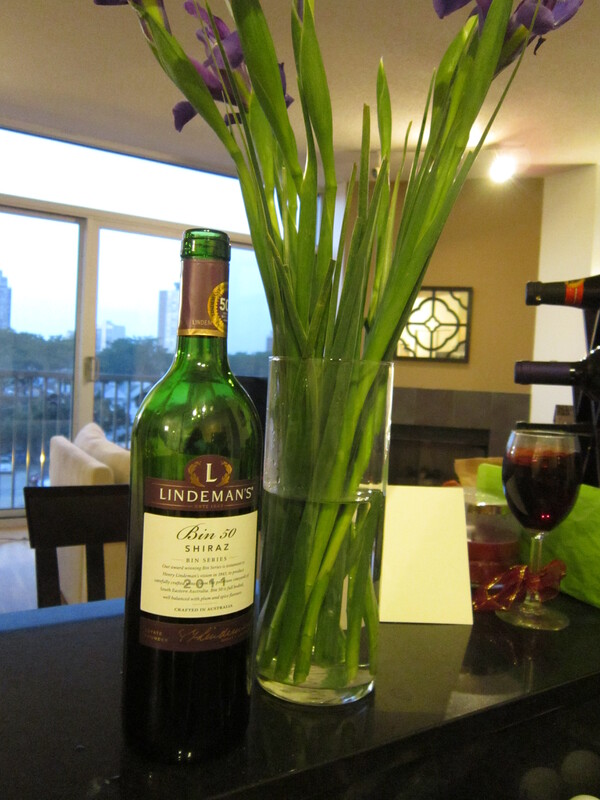 Sometimes when people hear that there’s going to be bacon, they bring you things like wine and flowers. So what I’m trying to say, you guys, is: make some bacon. We could all use the boost we’ll get from the salty, smoky, fatty, flavor. When I made the bacon mac and cheese in STL a few weeks ago, I think I won over everyone at that table for the rest of my life. Bacon. So simple. Who woulda thunk it? Mmmm…bacon! Everything really is better with bacon. We had some Kansas City baked beans recently and oh my goodness…I could have eaten the whole quart. Asparagus and mushrooms with bacon sound even more amazing. And if the result is wine and flowers, then sign me up. Mmm, I secretly REALLY love baked beans- the real kind, with bacon. So good. Whoa. Adding the boursin cheese is brilliant. Love it. Boursin is up there with bacon, I think. You just can’t go wrong with bacon. You just can’t. True story, once my grandma wrapped bacon around terriyaki soaked water chestnuts. I still dream about it. How would you feel about the fact that I’ve never cooked bacon before? Is that crazy? But everything looks great! Hope it sufficiently soothed your soul! Holy crap. Boursin and bacon….possibly best combo ever. I ate Boursin like it was goin’ out of style in France! So much cheaper there! Oh, I know- ALL the cheese was so much cheaper. And better. Pasteurization ruins everything.